Dear reader, I have again been away. What can I say? The days have been very busy with family and friends. Don’t worry, I have been advancing in the game. I have been working on space, equipment, coaches, skills, materials and players – that is the goal of the game, isn’t it? But now I find myself starting another version of the Community Lemonade Game. It’s a game within a game. The rules permit it, so – why not? You might ask which rule permits a game to begin from another? It’s the rule that says I can change the rules. You see, Dear Reader, I am coming to realize that since 2012, I have been defining a new tool for goal setting, problem solving, advancing the goal and community finding. It is a tool that uses the internet, and is something like a scavenger hunt. A hunt for me to do, and for you, Dear Reader, to follow the clues I leave behind. You may think it presumptuous of me to believe that you might be following my clues. The secret is, Dear Reader, that it doesn’t matter if anyone reads the clues I lay. They are for me more so than they are for you. The short name for the new version of the game is called “The Chinese Tour Group Version of the Community Lemonade Game”. The long name? “The Chinese Tour Group Version of the World Robot Olympiad Version of the Community Lemonade Game”. Yes, I know it’s a bit ridiculous – but tell me, did you laugh? It’s still being defined. There will be a playbook, sort of like the 2×4 Day Playbook that I created in 2017. You can get a copy here. There will be a Gauntlet (a challenge). There will be Seekers (the game players). There will be lemons to collect, and a satchel in which to collect them. There will be a Barrel, used to store all the things for which we don’t yet have a use. Our first contingency -delegation – whatever you call it – of visitors arrives August 2nd. Others, August 5th. On August 6th, we will kick off the game at Shoreline Village. Then the Playbook will be issued, with a number of smaller challenges that will be worked on throughout the week. There will be challenges of language. Learning English and learning Chinese and learning what to do when you don’t know enough English and Chinese. There will be challenges of technical learning. We will be learning from each other – with lots of translation help. There will be challenges of educational style. There will be a ritual making of Lemonade just as we did in 2012- so many years ago. 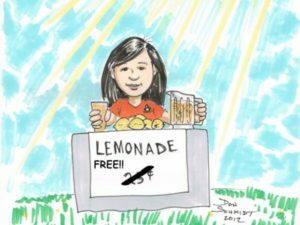 Will Lemonade mean the same thing to a Chinese native that it does to an American native? Dear Readers, I STILL need your help! I am looking for folks who might speak both English and Chinese. I’ve got interpreters, but I need more volunteers to support this BIG IDEA of mine. We are creating the problems, and you can be part of the solution. If you are interested in helping me, please let me know! Also, Dear Readers, my interns are working to design and implement a very special fundraising product, a custom kit designed by Master Model Builder Brian Heins. You can order your own kit here. THREE of my high school interns are now interested in the Robot Soccer game. They will be a novice team, but they will begin our journey into autonomous game play for us. It’s not about success the first time you try it, it’s about getting started and staying the course until success finds you. I would like to thank a few folks, groups and organizations. The Long Beach – Qingdao Sister City Association, the Robotics Society of Southern California, Will Wong, the WRO-USA organizer and Juniper Networks for their amazing support in this effort.